You see them at nearly every checkout counter. They quietly do the special job they were uniquely designed to do. They are successful, which is beneficial to the customer and pleasing to the retailer and manufacturer. The point-of-purchase (POP) display is an added value for all. In this case, the arrangement and identification of the product is key and supported with divider inserts. Product identification is easy with the color-coded caps on each tube. In addition, the colored caps draw attention to this neatly arranged POP display. Clear plastic tubing with an extra heavy wall makes for the perfect POP display. With an acrylic-like look, this thick-wall tubing is easily fabricated to the requirements of any display design. Available in 6-foot lengths, extra heavy wall tubing is transparent and is highly impact resistant. Plastic extruded tubing can easily be fabricated to create functional and attractive P.O.P. displays in many dimensions. The durability of the extra heavy wall plastic tubing allows for drilling, cutting, machining, bending, and bonding of the item to meet specific display requirements. For utmost success the point-of-purchase industry requires a brilliant visual display, and with PETG clear extra heavy wall tubing clarity is at the highest level. While it appears that the greatest advantage of PETG is the clarity, the fact is the PETG material is less costly than acrylic. You really get more for less making the advantages clear. Selling different quantities is not a problem for this manufacturer, as shown in this POP Display. Whether the consumer need is for an individual product, such as the traditional single package item on top, or the multi-pak of goods neatly gathered in the clear tube, consumer needs are satisfied with this attention getting POP display. Consumers can easily elect to purchase the multi-pak rather than each of the individual components. In doing so, they gain the storage of all components in the easy to open clear plastic tube. For added value, the multi-pak clear tube container uses a hanger cap, which makes this easy to hang in a retail display. When a consumer elects the hang-tube package, they gain the additional function of hanging the container for great space saving storage. 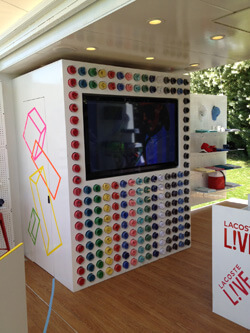 When Lacoste was looking to introduce its new LACOSTE L!VE collection, its designers wanted a unique display to help promote the line. According to Lacoste, it is not only a new collection, it is a new state of mind, a new way to be in tune with today's energy & vibes. It is an unexpected and cool combination of Lacoste original style and street art. Lacoste designers wanted a clear plastic container that would hold each shirt, allow the vibrant colors to show through, and integrate with other elements of the display. The initial design called for a customized injection molded package, but Visipak personnel worked with Lacoste designers to adapt a standard Permaseal Pak that would accomplish its merchandising goals at a fraction of the cost of the original designs.